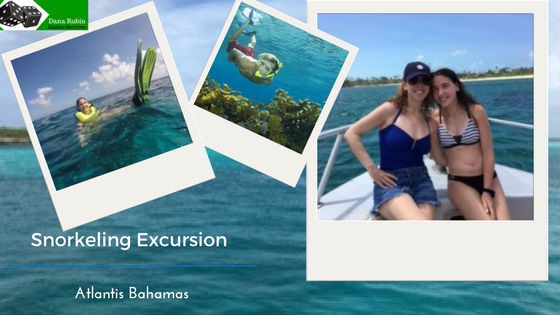 I had heard great reviews about snorkeling in the gorgeous waters of the Bahamas that I had to check it out on my recent summer Atlantis trip. I found Stuart Cove’s Snorkel Bahamas and decided to book the ½ day excursion with my 15 year old daughter. The excursion provided free hotel pick up and drop off and 3 different snorkel sites on one trip. We were picked up from the Atlantis at 8 am. I did not expect that the bus ride to Stuart Cove’s dive shop would be close to an hour. 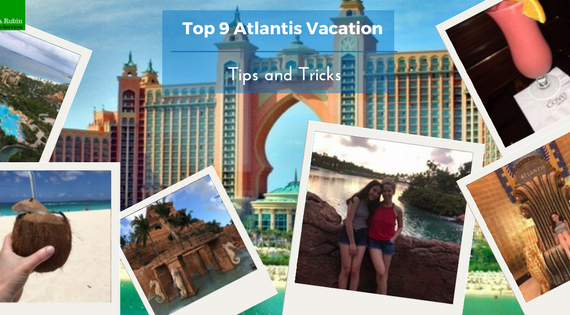 The Atlantis is one of the first pick ups and then the bus proceeds to make several stops to other resorts to pick up other guests. There was a lively crowd and my daughter and I took in the Nassau scenery. It was nice to have a ride all around the Island and see areas we would not have seen otherwise. Once we arrived at the dive shop we proceeded to a quick registration and then got seated on the boat. The crew was friendly and helped us get our fins and snorkel/mask. I had specifically gone to Target and bought my daughter and I snorkel and mask sets before our trip to use in the Bahamas. For some reason the morning of the excursion I decided not to bring my own set and instead use Stuart Cove’s (thinking it may be more “advanced” then the basic set I bought at Target). This was a fail on my part – all snorkel/mask sets do the same thing! The ones they provided were completely fine but next time I would bring my own to avoid any “ick” factor with using a snorkel that has worn by hundreds before me. Duh! Nonetheless, our equipment was fine and clean. There were about 15 people on the boat and we set out on a choppy fun boat ride to our first snorkel spot. They told us this was an “open boat” and things will get wet! Do not bring a lot of stuff at all – one small bag that you can store away. Little did we know that we were on a boat that is not the standard boat they usually use. The standard double decker boats (as seen in the pictures) had been rented out for the past few weeks so we were on the much smaller boat and boy, did we get wet! Was not expecting that but it was warm and beautiful so we went with it. I probably would ask next time I book the excursion if it will be on their standard double decker boat or a smaller vessel. On to the first snorkeling site which would be the famous Hollywood Bowl. The water is several shades of turquoise blue, changing colors every few feet. Bright and sparkling – We could not believe our eyes – the water was so clear and beautiful – it did not seem real. Anchor plopped down in the middle of the ocean and we were ready with our fins to jump off the ladder in the back of the boat. We looked right down below us and at our sides and all around us are magnificent fish of all different colors and sizes. Surreal! We cozied up to the Dive guide as he had fish food that he was sprinkling all around and the fish went crazy! My daughter got a bit squirmy and even I was a little freaked out at first but we loved every second of it and could not stop laughing! Truly amazing to see all these different fish swimming around you. The nice guide also took my daughter’s Go Pro video and took an amazing video for us. We continued on to the second stop which was a large coral reef. Water was not as bright but still cool with tons of reef to explore and different fish at this site. Again, in the middle of the ocean. There is a big adrenaline rush going on! I felt safe yet a few times was hearing the “Jaws” music in my head. Didn’t stop me and I was determined to push forward onto the last stop which would be the SHARKS! A hush came over the crowd as the guide told us about our last stop. Swimming above the sharks! The guides were very serious as they told us the rules. Everyone would be holding on to a rope, you needed to stay pretty still and you could not splash your fins around as the sharks could see you as fish food! These sharks are not in a cage like you see in the movies! Everyone had the option to go in the water or stay in the boat. My daughter opted out but I told myself “it’s now or never – I’m doing it”!! I was literally shaking as I lowered myself from the boat and held on to the rope. The dive masters dove way down with shark bait and we were told to keep our face in the water and not move about. Well, sure enough a few feet below us were sharks circling the water and swimming about! WOW! This was worth it and unlike anything I had ever seen. Terrifying and thrilling! I had conquered a fear and came out of the water smiling and proud (yet heart still pumping)! Boat ride back about 20 minutes to the dock and the excursion was over. The Dive shop has a cute little hut that sells food and drink – I was really ready for my Bahama Mama after this day! Loved it all – highly recommend! Bring a change of clothes so you can change out of your wet bathing suit for the 45 minute bus ride back to the hotel.